Fear of not knowing where your child is, if he is walking nicely with his friends or if it happened to him the worst ? By the time that run in an atmosphere a tad paranoid, parental control software classic, which allow you to monitor the activities of their child on his or her PC, are already out of date. Indeed, there are many gadgets and apps for tracking these little darlings out of the house, and go so much further. First way : by installing, on the smartphone of your son or daughter, an application designed to geolocate. Thus, the application "Find My Kids / Footprints", for iPhone, for example, can "track your children" and to know in real time their exact position, thanks to the GPS receiver. "Now, parents can keep track of the comings and goings of their children, to know where they were and if they arrived safely at their destination, the precise description of the app. "With Footprints, you can also enter landmarks, such as the school of your child, and receive a notification when it comes out. You can even activate movement sensors on the smartphone, which will notify you every time your child moves,” can one still read. Another application, which is similar, is called mspy. 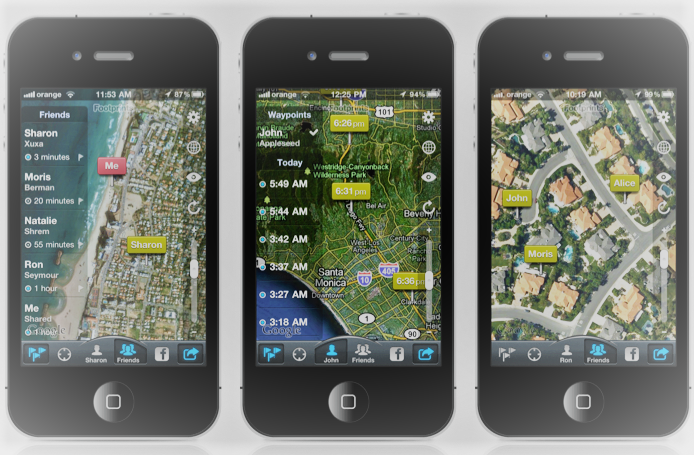 Working on both Android and iPhone, it allows there also to geo-tag your child, "to know where he stands in real time", but also to access the history of its GPS positions, or to set up "safe zones or prohibited areas" (“geo-fences”). Thus, if your child crosses a forbidden area, you will be notified by SMS. mspy you will, beyond the simple geo-location, to limit the use of apps (Facebook, Instagram...), to frame the Internet browsing, via filters and a browsing history "accessible in real time", and "to know with whom your child communicates", whether it's text messages or calls. The parent may also "refer to the time spent on each app". But do not panic, the privacy of the child remains "preserved" ! Because the content of the messages "is not accessible to the parents." Nevertheless, it will always be possible to "manage directory" in choosing who he can call or not. Good idea, however, the "emergency button" that allows the child to activate a silent alarm and alert the rescue “in 2 clicks”. With a GPS tracker or GPS watch, you will also be able to "relive history" of its past few days, and find out where your kids went. In addition to reassure parents, ensure the GPS tag allows the child to be "more autonomous and more independent", since he "can go to school without adult supervision". There is a large variety of GPS watches for kids that you can choose from, just make sure you read the reviews available so you can get the right GPS tracker with the features you want for your exact needs. Because "to let him more freedom, you must be able to know that it is going well". Yes, the freedom of a child comes with a price, apparently. The holy Grail of monitoring, it may be Teensafe - that (sorry) only the Americans, Canadians, Mexicans, Australians and new Zealanders can use (for the moment). If you live overseas and you are worried that your teen is harassed at school, sends "sexting", or visit sites not to be very catholic, the application TeenSafe is a small cookie that you can install, after having told his child... but also without the be warned... It allows you to see what the ado post on social networks, SMS, or messages sent (and removed) on WhatsApp or Snapchat.Of course, Teensafe also lets you geo-tag the smartphone of the child. Finally, last but not least, you can always install web cams in different rooms of the house, as well as in the garden, in order to create a video surveillance system. The application iCam, for iOS and Android, allows you, in real time, to monitor your child. At least when he is at home. A question arises : is the safety of your child supports such an oversight, never an adult would not be acceptable ? Tracking and its offspring, is it positive or rather negative ? You will know all about this topic in a next article to come. Ergo Sum is a Web site about life: not merely the things that we do to sustain life, but the things that make life worth living. The site's title is, of course, a reference to the dictum penned by Rene Descartes in 1637, "Cogito, ergo sum," Latin for "I think, therefore I am." We arrange this site into several topics; all contributions will appear in the topic indices. Topics are not named by nouns that might describe the grouping, but rather by verbs describing action that proves we are. Please take a look around, feel free to create an account for yourself, and to join us.